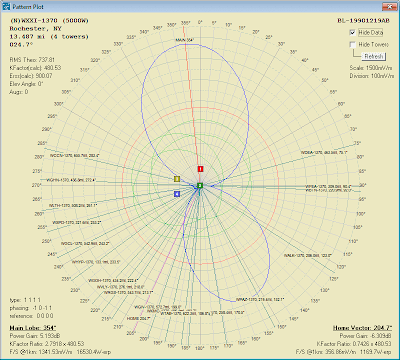 Let's explore some mediumwave stations whose transmitter sites line the Erie Canal at Rochester, New York. Three sites are in such close proximity to the canal that their ground radials almost dangle in its waters. The Erie Canal is a waterway that runs about 363 miles from Albany, New York, on the Hudson River to Buffalo, New York, at Lake Erie, completing a navigable water route from the Atlantic Ocean to the Great Lakes. 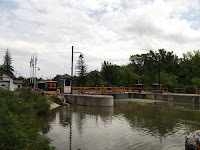 The canal contains 36 locks with a total elevation differential of about 565 ft. It was first proposed in 1807, and remained under construction from 1817 to 1825. The canal was the first transportation system between the eastern seaboard (New York City) and the western interior (Great Lakes) of the United States that did not require portage. It was much faster than carts pulled by draft animals, and cut transportation costs from $100 per ton to $10 per ton. 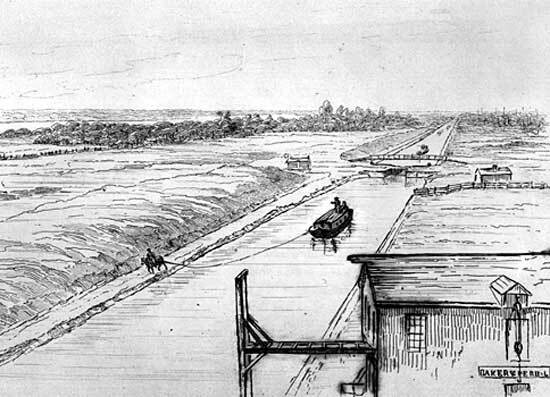 The canal fostered a population surge in western New York state, opened regions farther west to settlement, and helped New York City become the chief U.S. port. It was enlarged between 1834 and 1862. 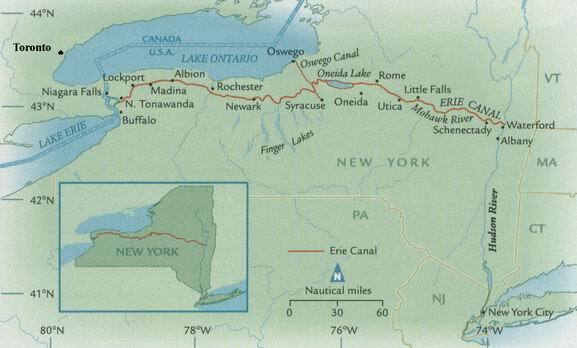 In 1918, the enlarged canal was replaced by the larger New York State Barge Canal. Canal boats were pulled by horses and mules along a towpath which ran alongside the canal. In modern days, the old towpath has been turned into a walkway for hiking and biking in many places. A one mile section along the Erie Canal through Rochester, New York plays host to no less than three mediumwave stations. Walking the canal, one passes within 500 yards of stations WXXI-1370 (5KW), WHTK-1280 (5KW), and WROC-950 (1KW). Let's take a walk along the canal in this area and I'll describe what we see, radio-wise. 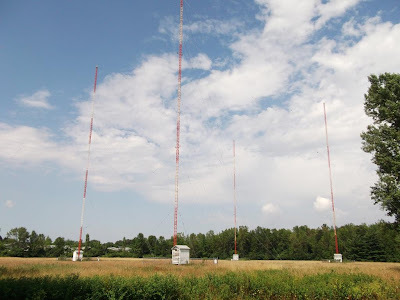 Pictured just below is the tower array of WXXI-1370. 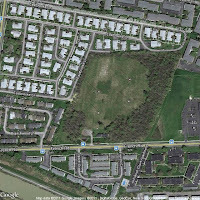 Starting at Lock 33 on Edgewood Ave. and proceeding west, after a few hundred yards we see WXXI-1370 off to the north about 500 yards and behind an apartment building just off of French Rd. WXXI's four towers stand in a rectangular trapezoidal-shaped array. Both daytime and nighttime powers are set at 5KW. Daytime coverage is omni-directional, using only one tower. The four tower array in use at night broadcasts with a main lobe at 354 degrees, and a minor lobe at 157 degrees. 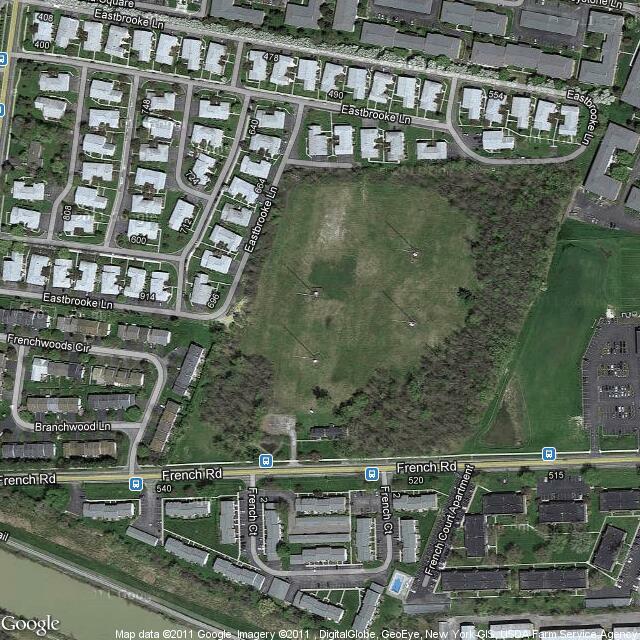 Gain in the favored direction, north towards the main population center of Rochester, is just over 5dB. WXXI is one of those rare stations that reference all towers in their orientation, spacing, and phasing to a non-primary tower: Tower 2. WXXI is Rochester's National Public Radio outlet on the AM band. It also broadcasts in HD on the FM band. WXXI dates its origins to July 2, 1984, when it signed on with a mix of NPR news programming, local news and talk, and public affairs programming geared to serve adult listeners in the six-county Rochester metropolitan area. The station is the successor to WSAY, a facility founded and built by the late Gordon P. Brown in 1936 as a small local area station with a 250 watt signal on 1210 kHz. It moved to 1240 kHz in 1941. In the pre-war era WSAY became best known as the home of local music programs at a time when its network-affiliated competitors were airing a mix of local news and sports with national drama, comedy and music/variety shows supplied by the NBC and CBS networks. WSAY also was the first station to hire an African-American announcer for a regular shift. 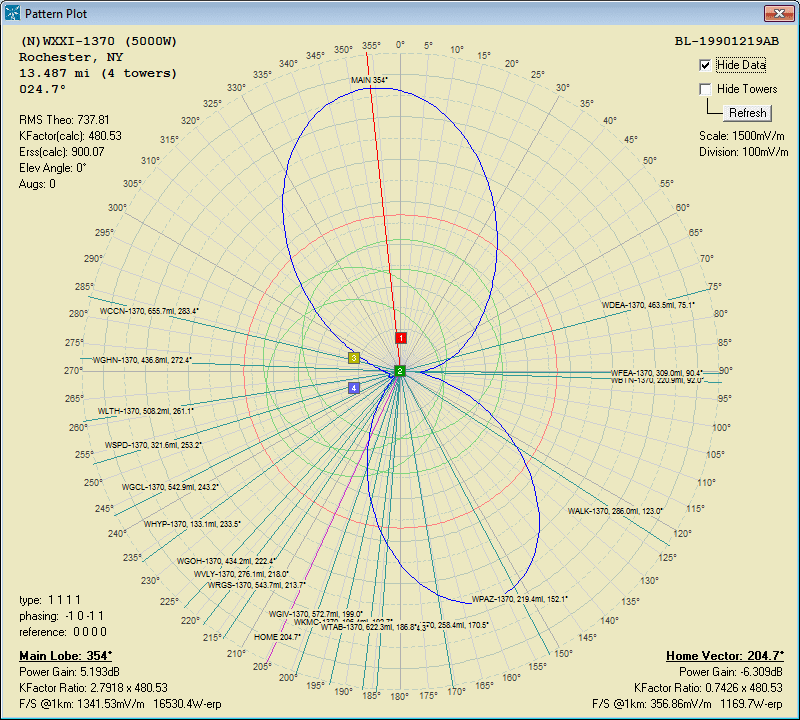 Following World War II WSAY received FCC permission to improve its signal by moving to the regional 1370 kHz frequency. It relocated its transmitter from a downtown Rochester building with rooftop antenna to a modern four-tower plant in suburban Brighton. It increased power first to 1000 watts and shortly afterward to 5000 watts full time. Over the next three decades WSAY operated under a number of formats, from pop standards to top 40 to progressive rock to country. Gordon Brown owned WSAY until his death in 1979, and his estate sold it to the Dickey family. The Dickeys operated it from 1980 to 1984, also under a variety of formats from personality adult contemporary to country to talk, eventually changing its callsign to WRTK. The license and facility was eventually sold to the WXXI Public Broadcasting Council, and briefly taken dark before its summer 1984 relaunch as WXXI-1370 with a round-the-clock non-commercial format of news, talk and public affairs. The WXXI news and public affairs department produces local newscasts seven days a week and local talk programming every weekday, along with NPR news programming and locally produced documentary and specialty offerings. It currently operates from modern digital studios in the downtown Public Broadcasting Center, and upgraded transmitting facilities at the Brighton location first brought on line by Gordon Brown in 1946. Over the past 25 years WXXI-1370 has achieved success in attracting a sizable audience for its news and public affairs programming, consistently ranking second in audience size among the Rochester market's AM signals and second among stations on either AM or FM with spoken-word (news, talk, or sports) formats according to Arbitron quarterly audience measurements. It has also won numerous local, state and national awards for its program offerings. Shown below is WXXI-1370's nighttime pattern plot. On the plot are shown various co-channel stations around the region and where they fall into WXXI's pattern.